Oliver Laurence “Ollie” North is a former United States Marine Corps Lieutenant Colonel, conservative political commentator and television host, military historian, and author. North was a National Security Council staff member during the Iran–Contra affair, a political scandal of the late 1980s involving the clandestine sale of weapons to Iran and the diversion of proceeds from the arms sales to support the Contra rebel groups in Nicaragua. In 1994, North unsuccessfully ran for the United States Senate as the Republican Party candidate in Virginia. Republican Senator John Warner of Virginia endorsed Marshall Coleman, a Republican who ran as an independent, instead of North. North lost by a 46% to 43% margin to incumbent Democrat Charles Robb. Coleman received 11%. Any idea on how he fared in Church Hill precincts? 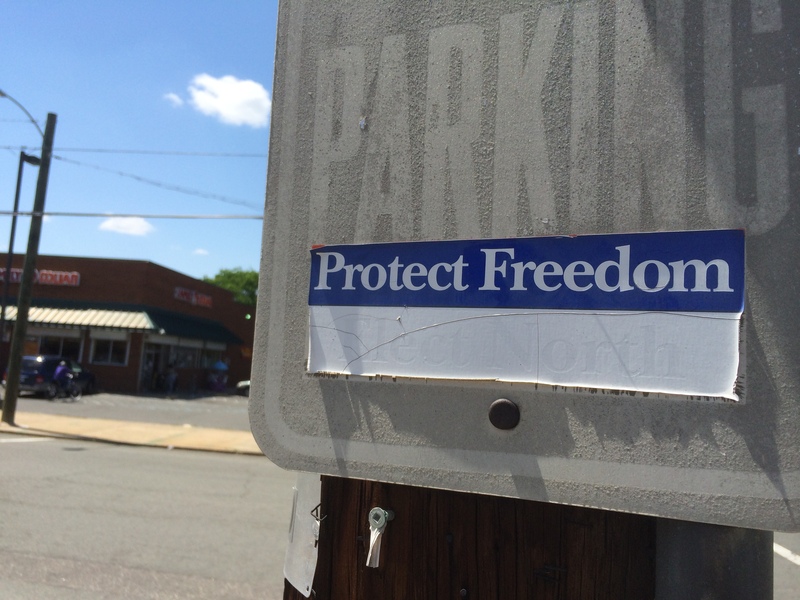 I am confused, what does “Protect Freedom” have to do with Ollie North? It’s an old Ollie North bumper sticker from 1994, on a sign at S and 25th Streets. You might be able to make out ‘Elect North’ on the white part.